Want to know a super-crunchy secret? I bring my own hand soap to work. Now, it’s not just about triclosan and body burden. I mean, yes, it’s 95% about those things. But the other 5% is all about vanity — harsh antibacterial soaps really dry my hands out! I like to look down at my hands and not momentarily panic that I’ve somehow Freaky-Fridayed with a 95-year-old, thank you very much. I’m sure you agree that hand soap must be moisturizing. If you’ve hung around these parts for awhile now, maybe you’ve happened by my DIY antibacterial & moisturizing all-natural foaming hand soap recipe. It’s a good one. But not everyone is into the foaming action. Or maybe you have a lovely liquid hand soap dispenser that goes super well with your bathroom. So I figured it was time for another option. Because good interior design is not to be messed with. 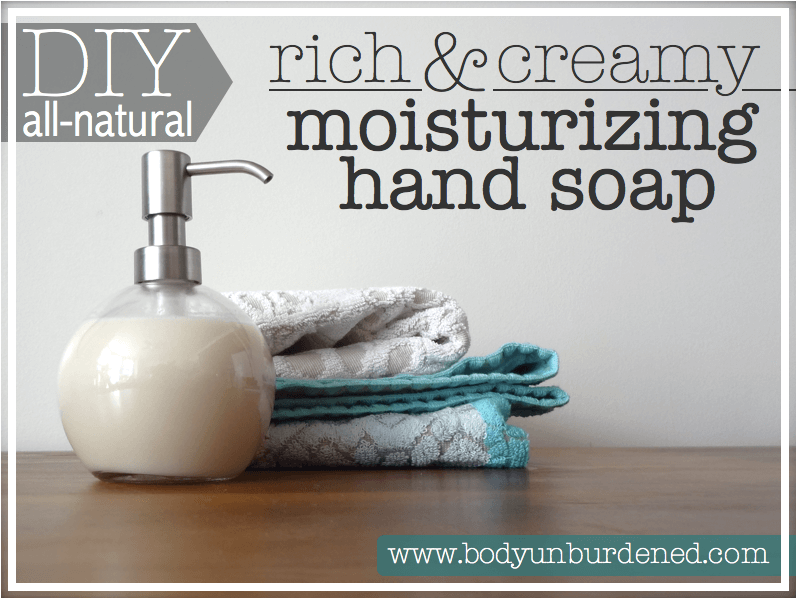 This DIY all-natural moisturizing hand soap is sooooo rich and creamy. NOTE: I like to make and suggest making smallish batches like this in case there is any bacteria growth. Yes, the essential oils will help preserve the soap, but better to be safe than sorry! Measure your carrier oil and put it in a small bowl. Stir in the guar gum until it is an even consistency. This is an important step: guar gum mixes really well with oil, but not so much with water or castile soap. So if you simply mix everything together at once, you’ll end up with a chunky mess. I warned ya! Is there another thickening ingredient that I could use instead of guar gum? I’d love to make this, but I don’t have guar gum on hand. I absolutely LOVE your website! Just made your foaming hand soap last night; it’s awesome! Thank you so much for this! I really appreciate when other people talk about doing things like bringing their own soap. It can be hard to always be fighting those battles (‘yes, I’m the difficult one’) all the time and even over the internet, having someone like you reaffirm that we don’t always have to follow the norm is reassuring. As for the matter of the soaps- Yes! Castile and water is insanely too liquidy in regular pumps. I stole my Mom’s old Bath and Body Works foaming ones and that’s what I’ve been using, but I’d much rather use a pretty one with moisturizing soap. Can’t wait to try this! PS I have found that foaming castile/water is an amazing makeup brush cleanser though. My brushes come out like new! Could you use vegetable glycerin and/or aloe gel instead of the guar gum? what are your thoughts on adding vitamin E oil for additional preservation? Do you know any references for the correct amount of vitamin E oil to add to recipes to extend shelf-life? Thanks! Sure, but it wouldn’t thicken it nearly as much. If you do it, report back and let us know how it works! Thank you so much 🙂 Hmmm I’m not sure but if you experiment and find something good, let us know! Definitely! I usually just rely on EOs for preservation but that’s something good to look into. Nadia, I just found your website today and I am thrilled to read all your recipes and suggestions. Your face cleanser is alot like the one I make for myself. I did today add a smidgen of castor oil, some hemp oil and a few extra essential oils to the original recipe. My recipe is honey, glycerin, liquid castile soap, vitamin E, few drops of tea tree oil along with my favorite essential oils, frankincense, rose, geranium, lavender, ylang ylang. Love all the information I am learning from your web site…keep up the good work! I can’t wait to try this. I have a recipe that I love and it absorbs quickly into my hands since they are so dry but it lingers on my body and stays greasy. I will try this one. Thanks you! I’m excited to try this, as well. I have some purple Ball jars and pumps that I plan to make for Christmas gifts. Was looking for a recipe that wasn’t too watery. This looks amazing! Will try one for myself soon. How much does this recipe make? Wondering how much I will need to increase for the amount I plan to make. Also, Nadia, would coconut oil work for carrier oil? It makes about 8 oz. Hmm I wouldn’t suggest coconut oil since it solidifies at 74°F so may mess with the consistency. Which castile soap are you using? BRAND NAME. Do know if it is gluten free? On the EO, how do I know which ones I can use on my skin? I use the castile soap I link to in the post – it lists the ingredients on the label. I am so excited about this recipe!!! Ive had sooo much trouble with the castile soap/ water and olive oil combo becasue its sooo watery and buying a glass dispenser that foams is nearly IMPOSSIBLE unless you buy from etsy but then again… im worried that these things might not work and im left hanging. The recipe that I was using for body wash is the same as above but with aloe vera gel. Can I make it the same way????? (crossing my fingers that you say yes! haha) My husby needs a thick body wash and thick handsoap in order tobe converted! I am not up for the challenge to make my own dispenses, and all my bathrooms already have pretty bathroom sets. Which by the way, brings me to my other question…. can you store EO in ceramic containers? like the kind that they sell in Bed bath and beyond? thank you so much and would really appreciate the advice! Interesting that you are using Castile Soap for this – Love it (even if it’s from amazon)! I just wanted to let you know how much I love this hand soap recipe. It’s amazing! This is my third time making it. I experimented with different scents of Castile soap, essential oils and different carrier oils. I also use xanthan gum as a thickener (its what I had on hand). I know it sounds like I’ve changed the entire recipe, but you gave me the foundation! Awesome!! That’s the best thing about DIYs – you can play around with them and experiment! So excited to find this recipe, and your idea of thickening with guar gum! Do you think this might work to thicken dishwashing liquid? Just wondering if this would work as a body wash, or if you have another recipe for a body wash? Love your site, thanks!! Hand soap, face soap, shave soap… Awesome. Thank you, Nadia. I used shea butter castle soap (Dr. Wood’s). My essential oils were 12 drops lavender, 3 tea tree. Yes, it totally would! And thank YOU!! Yes, it could if you need it for body acne. I’d change the EOs if that’s not an issue for you! Am making your hand soap to give as Christmas gifts. What is the shelf life? If I make them in October/November will they still be good at Christmas time? Ohh no. You always have to be VERY careful with DIYs that contain water. I’d make them right before you intend to give them as gifts and instruct whoever you’re giving them to to you them within a couple months. Can I use agar agar instead of guar gum? No clue! If you try it, please let us know. I know the purpose is to be an all natural soap….. But, could a preservative such as germaben2 be used to extend the shelf life???? I have no clue what that is but you can do whatever your heart desires. I’m hoping you might have a recipe or suggestions for me: My mother has very dry, sensitive skin. Even in the summertime, she has dry, cracked hands, and her sensitive skin doesn’t even tan very well. She usually ends up with sun poisoning and then it fades back to a pearly, freckly white. Every night, I watch her grab a giant bottle of store-bought lotion (chock full of nasties) and wish I could find a more natural substitute for her. She’s big into eating clean and green, and I’ve even managed to talk her into using coconut oil on a daily basis for face wash and other little things. My problem is that she’s so particular about her lotions. She doesn’t like the greasy feel of most lotions, and since she has a habit of touching her eyes/face, it needs to be safe for that as well. Even with her favorite lotion, her eyes get irritated if she rubs them at night. I saw your recipe for antibacterial and moisturizing hand sanitizer that I plan to make her for Christmas, but I was wondering if you had a recipe just for lotion. A super hydrating, non-greasy, not super oily hand lotion. As I said, I love your site and look forward to using a lot of the recipes you have available. And I look forward to hearing back from you! Hi can i replace castile liquid with castile bar? please advise. Yes, you will just need to melt it into hot water. I am unsure of the amounts, but I’m sure someone has it somewhere! Can you suggest an amount for using liquid castle soap? Or does it have to be the solid bar and water? -Thank you BTW! Your blog is still the one I always come back to since you were the first one to inspire me to go chemical free, and I am so thankful you put the time and effort into these homemade recipes that would cause me a headache to figure out. Me again, it’s midnight here, and thus I’m a little lazier and sleep-drunk apparently, ignore the dumb question I just posted, but still thank you! LOL glad you found your answer! I am binge-reading your blog right now! I’m so excited to try some of your recipes, especially for the facial cleanser and oils… As a 30-year-old with acne, I’m desperate! I’ve tried everything under the sun for so many years now, my poor skin is exhausted. As I get ready to buy ingredients for everything, I’m trying to minimize my initial investment as much as I can. Can you recommend a different thickener? Would it cause any problems with the integrity of the product if I used xanthan gum instead? Thank you! I have made some variation of it for just about all of my needs: hand soap, body wash, shaving lotion, shampoo, and even dish soap! I just use different essential oils depending on the use, and I sometimes slightly vary ingredients as well. I have always used xanthan gum instead of guar gum because it is what I had on hand, so that might be helpful for those asking about a substitute. I have also added vegetable glycerin to the recipe for increased lather. I can’t thank you enough for sharing this recipe, and whenever I give others the recipe (lots of people ask on social media groups) I always make sure to let them know I found it here! I just tried this recipe today, and my husband and I love it! We are trying to live chemical-free one small step at a time. And this is one of our first steps! Thanks for the detailed instructions. I’m excited to try more of your recipes! If I use castile soap with that already has lavender, coconut, olive, hemp, and jojoba oils in it should I still use the essential oil in the recipe? I would use it, yes, for the sake of keeping bacteria at bay. try adding a drop of grapefruit seed extract as a preservative to avoid bacteria growth. Works great! I’ve been making my own disposable wipes for years and without the GSE there would eventually be mold in the wipes; with the GSE there is none. Just made this and it’s lovely and thick. I love this post! And I bring my own doterra hand sanitizer to work with me Thanks for the recipe! I just used your recipe for the first time and the consistency is great! I tripled it because I have five kids and we wash hands A LOT around here. 😉 A triple recipe filled two of my glass soap dispensers. I used Young Living grapefruit EO, 45 drops, but I can hardly smell it at all. Either the Dr. Bronner’s or the almond oil overpowers it (I used the exact same castile and almond oil pictured in your how-to). Is there another scent that would cover the soap/almond smell better? Thank you! Where did you get that lovely & beautiful hand soap dispenser? Do you have a link to it? I would love to purchase a few of those for the house. Hey, Christine! That’s one level teaspoon – more or less can make for a bad consistency! I’ve been using your recipe for about a year now and really like it. And we’ve always been an expensive soap kind of house. But yours never dries out my hands and smells wonderful. I use Dr Bronner’s Lavender Castile as a base and xanthan gum instead of guar bc that’s what we have around. I love the texture and suddsing of this hand soap, but I find it very difficult to transfer in to a hand soap container. Any tricks to doing this? Perhaps a funnel will help? Also, I typically add the water + soap to the soap dispenser, then pour in the oil + guar gum, cover the top of the bottle just with my hand and give it a good shake. This could solve your problem! Hello! I’ve been searching for a recipe that isn’t so watery! Quick question.. what would you say the shelf life on this is if you had to guess? My question as a mom and teacher: do you have any concerns with having your children use nut oils daily? I am so afraid if me or my daughter have this residue on our hands, or if a friend comes over to play, and we end up causing anaphylactic shock. I am so afraid of this! What would be your nut-free carrier oil of choice? I read your other blog post – would it be avocado oil? Also, is it possible to get away with using scented Dr. Bronners and skipping the EO’s? Thanks so much! Your super-detailed posts are amazing! Have you had any problems with the soap clogging the dispenser? My experience with homemade liquid soaps is they need to be in a foaming dispenser to avoid this, but maybe the consistency of this one from the guar gum helps prevent clogging? I would really like to try this as I find most commercial soaps way too drying. What do you think about adding some avocado oil to boost the moisturizing ability? What can I add to my hand soap, as it is too runny? Thanks for any help ! Hey, Ginger. Did you add the guar gum? Just add more if it’s still runny. Can I use coarse sea salt to thicken your liquid hand soap recipe? Gaur gum dos t seem to be working for me? is arrowroot flower or salt an okay substitute for guar gum? as a thickening/emulsifying agent? A friend of mine is allergic to hemp oil, which is the base of all Castile soap. Could you suggest a good alternative soap base without help oil in it? Definitely not salt… I’ve never used anything besides guar gum so I’m not sure about arrowroot. You’d need a considerable amount more than of the guar gum. Really, I’d suggest buying a different guar gum — just a little really thickens the mixture, so I can’t understand why yours isn’t working. Definitely not salt… I’d suggest buying a different guar gum — just a little really thickens the mixture, so I can’t understand why yours isn’t working. Hi ! What would you say the shelf life is for the 8 oz it creates (since you talked about the bacteria)? I would be putting it in my bathroom dispenser, but it is white on the outside so I won’t be able to see in. It’s just me and my husband at the house most of the time so it’s only getting used as much as we use the bathroom. Just finish making this and it came out perfect…Made a second batch and using it as body wash. I customized 15 drops of essentials from my personal favorite collection. Thanks to Plant Therapy. Do you have a ph balanced hand soap recipe? Maybe one containing aloe Vera and Castile? Am I able to incorporate beeswax or honey into this recipe? Honey – yes. But I wouldn’t do wax. Is there a reason you want to add it? I love that soap dispenser !! Can you tell me where you found it ?? I’m excited to try this recipe today. Although I am making it with the Castile soap that I make myself. Thank you so much Nadia for this perfect soap. My hand r really sensitive and dry, i noticed a great difference from the first time. Can i use it for my face as well ? The scented castile soap won’t have as much essential oils so the scent and effectiveness will be diluted. And yes, avocado oil would be a great option as would fractioned coconut oil. Hi there, thanks so much for this recipe! I just wanted to let anyone know that arrowroot isn’t a great alternative to guar gum, it just stays mixed in the oil but doesn’t emulsify the mixture. If anyone was wondering! Never mind – it still works when shaken. Will do it properly next time! 🙂 Thanks for sharing! Yes, guar gum works like a charm!! Ide like to try this recipe out soon.I was wondering what you mean about bacterial growth in the soap?? Obviously it would be great to make bulk batches as i go through handsoap quite a bit. Can homemade soap ‘spoil’? How will i know? I have been making your soap recipe for 7 months now. In the winter, my hands always dry and crack something fierce. But not this winter! My hands hate it when I use any other type of soap now…. Both of my hands thank you for sharing! I’d love to make this today but I don’t have any guar gum. Would xanthum gum work? Hmm honestly I’ve never tried it so don’t know! If you a give it a try, please report back! Hi Nadia, I’m from Brazil and discover your website in my navigation. I’ve a question: This recipe does not need to heat, is it just mixing? Right? Thank You very much and I loved your blog! Hi Nadia, please can you guard me on the type of fragrance to use for my hand wash as my friend love a super fragrance. Love this soap! But really curious about the shelf life and possible bacteria/mold growing. How long will this hand soap last without being unhealthy? Any ideas on natural ways to extend the shelf life? I want to make this awesome soap for friends and family but am worried that someone could get sick or something. I’d love your feedback! Thank you! Would it be bad to use coconut oil in place of almond oil since coconut oil can solidify, or do you think it’d be okay? Yes I wouldn’t suggest it since it solidifies! I followed the recipe using Dr. Bronner’s baby castile, citrus-fresh YLEO, guar gum, and I can’t remember which carrier oil–I think maybe YL’s V6, and it’s properly thick, smells great, but has always had a white layer at the top about 1 cm thick and looks like castile soap underneath (nearly translucent and yellowish). I shake it up and it looks like yours, but it always goes back to layered. It has a nice consistency whether I shake it or not. Any ideas what is wrong? I call it my lemon parfait soap lol. Hi Nadia – I would really love to try this hand soap recipe. I have such sensitive skin and get itching and even respiratory allergic responses to fragrances in a lot of hand soaps. I’m just a little worried about using the essential oils in the recipe because I have a cat and I’m afraid of exposing her to it from my hands. I’m thinking it might be okay because it would be so diluted, but I don’t really know for sure. Can something else be used as an alternative to the essential oils? Hi, Linda! You can just go ahead and keep them out though I don’t personally think it’s anything to worry about at all. I used olive oil instead of almond oil and my soap ended up so thick in-fact it was a paste, what could have gone wrong.